If you’ve ever watched a young child’s football game, there’s very little organisation to it. Everyone wants the ball, so all the children, often goalies included, run after the ball like metal chasing a magnet. You’re witnessing their initial steps into the sport, so they don’t have a great deal of comprehension regarding player spacing, defence, or anything else for that matter. The same is true, in several ways, to students within the healthcare community. That's why training, specifically simulation training, has become a pivotal piece of their education. We aim to simulate real-life clinical situations that facilitate learning opportunities within a safe environment allowing for mistakes to be made, reflected upon and the knowledge gained to be applied to their work with real patients. Creating believable simulations is critical to the future success of these students and soon-to-be Healthcare professionals. During my time here, I’ve loved seeing our students grow and develop. There is always a sense of anxiety amongst the students whenever they experience simulation for the first time, however as they become immersed within the experience, the nerves fade and they can focus on the task at hand. Making the simulations as realistic as possible is fundamental to the learning experience and helps the students make the link between theory and clinical practice. The simulation suite allows for scenarios to be designed to match the level of competence that each cohort of students have. We can begin with relatively basic, fundamental clinical skills and as their confidence and knowledge increases, build towards high fidelity, multifaceted scenarios that can incorporate a variety of emergency situations such as a major haemorrhage or cardiac arrest. With our simulations, we need to get the details right, it is essential that the environment we create for students represents the clinical environment as closely as possible. That’s why we rely on the KwickScreen privacy screens. One of our main simulation rooms is set up as a large operating theatre, KwickScreen allows us to have greater flexibility within this space. We've used KwickScreen as a dividing wall to create an additional area that operates as an anaesthetic room. Even though it’s a simple divider, it makes the students feel like they’re in a separate environment and brings the realism of a small, confined space and the challenges that this creates. An additional advantage is that the KwickScreen allows for us to run sequential simulations within the same space, increasing realism and reducing distraction from other activities within the simulation environment. Adjusting the size of the room helped students begin to understand the challenges and difficulties that working in confined space with a large team can have. It helps to build communication skills, logistical planning and team work. Another area where we’ve taken advantage of KwickScreen is with our ambulance transfer training. We have a screen where one side resembles the outside of an ambulance, and the other is the internal view. This teaches students how to transfer critically ill patients from the operating theatre to the mock ambulance or vice versa and the preparation and logistical challenges that safe patient transfer entails. In the real world, these patients are often unstable. Students will need to deal with any eventuality— like if their blood pressure falls or they begin to bleed; the high stakes nature of this activity makes realistic simulation all the more important. The biggest benefit to simulations is learning from mistakes in a safe environment where the risk to patients is negated. Feedback and personal reflection on any errors made help to shape safe professional practice. This is why it’s imperative we have the very best simulations possible. KwickScreen has really made this a much easier process; we are able to simulate real-world situations. 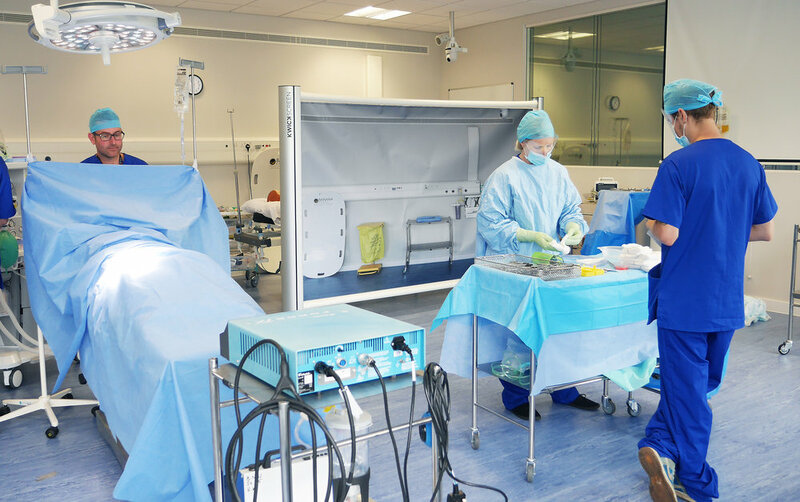 The simulation facilities have been designed to replicate the clinical environment of the operating theatre, KwickScreen provides the visual aids needed to bring the situation to life. Plus, it doesn't just improve how each person performs within the simulation, but also their ability to interact and communicate in a high-stress environment, this is a critical part of the role. We are confident that we have created an authentic training environment for our students by immersing them in simulated, real-life environments and providing practical experiences. Gaining experience of unexpected situations and clinical emergences better prepares students for unforeseen events in real life.